1.Smooth and Stable Movement: Flexi Spot's gas spring hovering system allows the workstation to smoothly adjust for sitting or standing with just a light squeeze of the handles. 2. Large Work Surface, Wide Keyboard Tray: offer a deep, wide surface. There's room for your work materials and enough space to put your monitor at a comfortable reading distance. 3. 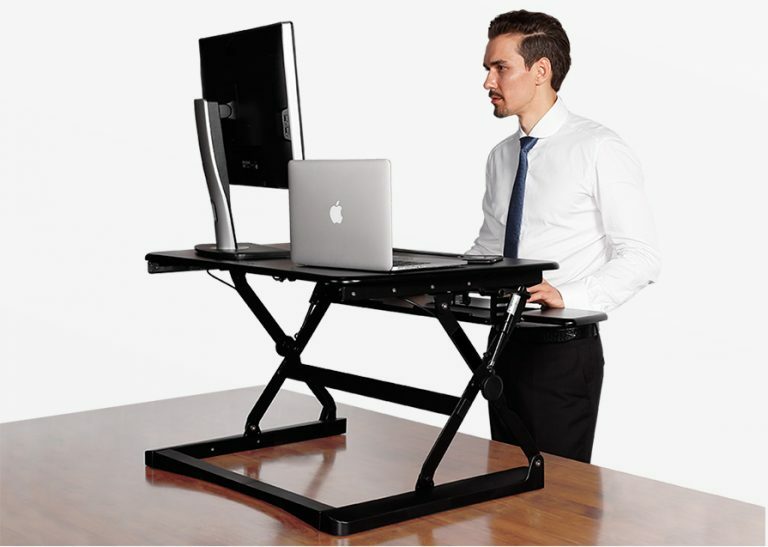 Ergonomic Benefits: Choose from 12 height levels as you transition between sitting and standing throughout the day. Our products support a better posture and healthy wrist and arm positions. 4. Straight Up and Down Movement: Our workstation rises and folds vertically, within its own footprint. There's no need to make spatial accommodations, as may be required in comparable products. 5. High Quality Construction: Support up to 35 lbs., has undergone extensive testing for balance, stability, and movement - including a fatigue test of 6,000 height adjustments. PLEASE NOTE: DUE TO SIZE & WEIGHT THIS ITEM WILL BE SHIPPED BY FREIGHT TRUCK TO YOUR LOCATION. WE WILL DETERMINE AND EMAIL EXACT FREIGHT COST FOR YOUR APPROVAL PRIOR TO SHIPMENT.THIS COST WILL MOST LIKELY BE DIFFERENT THAN WHAT APPEARS IN THE SHOPPING CART. WE NEVER ADD ANY ADDITIONAL OR HANDLING CHARGES.